GolfBC is pleased to offer two wonderful facilities centrally located in the beautiful Okanagan Valley. The Okanagan Golf Club, a 36-hole facility consisting of The Bear and The Quail courses, and Gallagher's Canyon are both nestled amongst spectacular ponderosa pine forests and emerald greens. 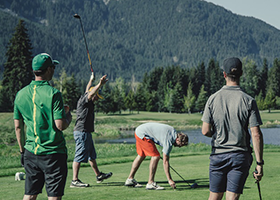 If time is limited and you want to be able to enjoy all the highlights of the breathtaking city of Kelowna, perhaps our 9-hole mid-length executive Pinnacle Course at Gallagher's Canyon would be more fitting.